In recognition of Cataract Awareness Month, we’re focusing on four areas can help seniors live safely and independently while managing impaired vision. The American Academy of Ophthalmology urges seniors to be aware of the dangers of ignoring cataracts, which can lead to injury and permanent blindness. 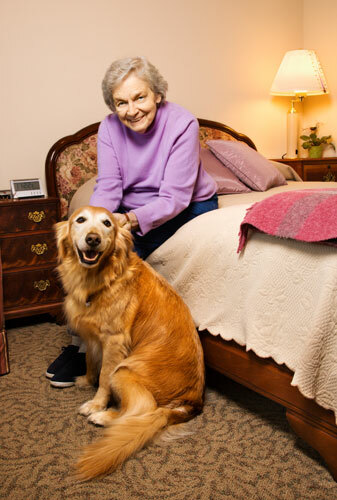 Seniors often can continue to live safely at home while undergoing cataract treatment or managing low vision. As vision declines, the risk of falling increases, and up to 40 percent of nursing home admissions are due to falls or fear of falling. Whether a senior is preparing for, or recovering from, cataract surgery — or simply suffers from impaired vision not related to cataracts — here are four areas of focus for those who need help living safely at home. Preventive health: A senior’s regular exams should include vision, including a check of eyeglasses to make sure they fit properly, as well as blood pressure, balance and gait. Home design: A home designed for someone with low vision includes bright lighting, pathways free of furniture and cords; visual contrast between floors and walls; nonskid flooring, and bathroom safety devices such as grab bars and raised toilet seats. High-tech assistance: Monitoring and safety devices — such as large-button phones with talking caller ID, wearable emergency communications devices and fall monitors — provide peace of mind. Self help through education: “It All Starts With a Fall — Your Guide to Help Prevent Falls” helps readers identify and correct fall hazards in their homes and yards, teaches about personal safety tools that can make living at home a success, and offers instructions for what to do if they fall. A free copy, along with valuable coupons for fall prevention products, is available from The CareGiver Partnership. Cataracts — the clouding of the eye lens — will affect more than half of all Americans by the time they are 80 years old, according to Prevent Blindness America. Adults 65 and older should have regular eye exams to check for cataracts and other eye diseases. Call our team of Product Specialists for personalized help. loved ones with answers to their caregiving questions, including information about home health care products and supplies, from our Wisconsin-based team of Product Specialists who are all current or former caregivers. The company’s Web site provides the largest online library of resources on subjects most important to caregivers — from arthritis to assisted living, and Parkinson’s to prostate cancer — as well as access to more than 3,000 home care products for incontinence, skin care, mobility, home safety and daily living aids. The CareGiver Partnership was founded in 2004 by Lynn Wilson of Neenah, Wis. Visit http://www.caregiverpartnership.com to learn more or call 1-800-985-1353. Watch this video on ways to make a home safer for seniors.